Set a rack in the center position and preheat the oven to 450 degrees. Spray 4 6-ounce ramekins with nonstick cooking spray. Melt the butter and white chocolate in the top of a double boiler (or microwave in bursts of 15 seconds), stirring until smooth. When completely melted, stir in the confectioners' sugar. Lightly whisk the eggs and egg yolks in a large bowl. Stir in the red food coloring and melted chocolate mixture. Whisk the cocoa and flour in a small bowl to combine. Add to the batter and stir until just combined. Divide the batter evenly among the ramekins. Place the ramekins on a baking sheet and bake until the sides of the cake are set but the centers are still soft , 14 to 15 minutes. Let the cakes rest for 2 minutes, then invert them onto dessert plates. Serve the cakes immediately. 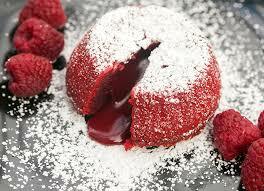 Use powdered sugar to dress it up or melted chocolate to garnish it. Enjoy! 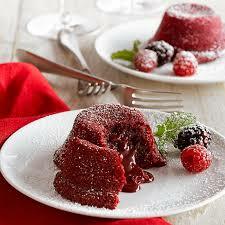 I love lava cakes but never thought of making a red velvet version. Very creative and perfect for Valentine's Day.